Several weeks ago, I became the second owner of a 2003 Lexus LS 430 in generally excellent condition save for a blown subwoofer. This effectively limited my soundtrack to classical and NPR for several weeks. A new sub from Lexus is $300 because it’s a luxury car and parts cost luxury car prices, the fact that it’s 11 years old be damned. Aftermarket options are limited because the Mark Levinson system uses a two ohm impedance and it’s an open-air setup. One well-known drop-in option is the Polk db840DVC, which has two four-ohm voice coils. Wire them in parallel (+ to +, – to -) and you get 2 ohms. Remove the seat cushion. This is best done from inside the cabin since it requires some force. Pull up on the cushion from one side to the other until it’s free. Hold at a 45 degree angle or so and then pull forward until the rear guides from below the seat back are free. Set it down and disconnect the heated seat plugs on either corner (use a small flathead screwdriver). Remove seat cushion from car. Remove the rear headrests. Behind both headrests are plastic plugs. Remove those to access the first two nuts. Use a deep 10 mm socket with at least a six inch extension. Flip down plastic cover behind the armrest. A third nut is behind the plastic cover behind the armrest. Pull down the armrest and open the pass-through, then you’ll be able to pull it down. Use the same deep 10 mm socket. 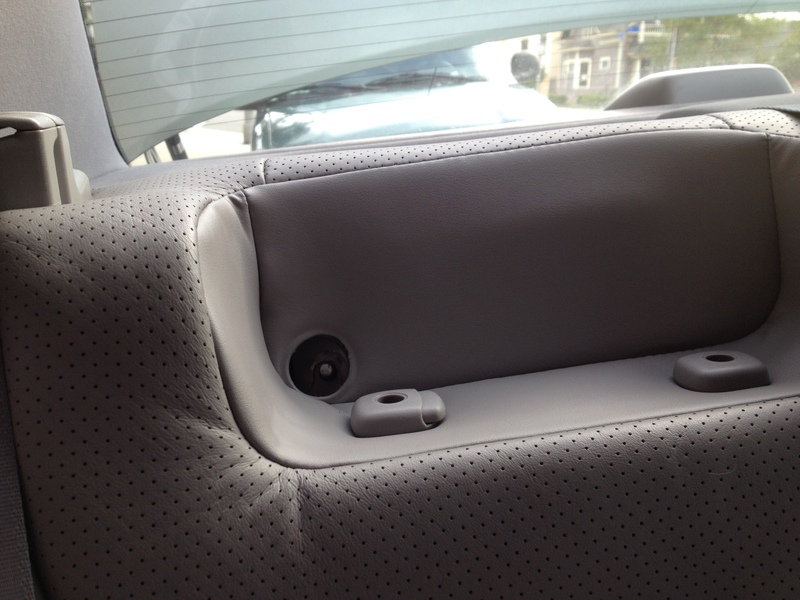 Slightly lift up the armrest to get the plastic cover to pop back into place. Remove lower screws. There are four 10 or 12 mm screws on the bottom. You don’t have to remove the seatbelt bolts; they’re screwed on a lot tighter and it’s not worth the effort. Disconnect heated seat control plug. On the passenger side of the seat is an electrical plug that goes to the heated seat buttons in the armrest. Pull the black restraint out of its base first (pop the side with a screwdriver). Once you have it unplugged, pull the seat forward and set it on the floor. Unscrew top-of-seat seatbelt mounts. 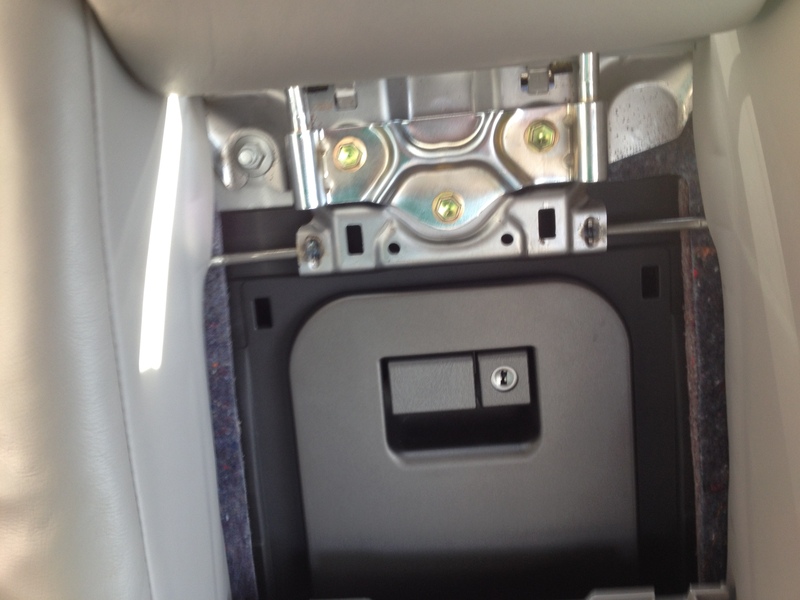 The seatbelt mounts on the top of the seat are held on with Philips-head screws. 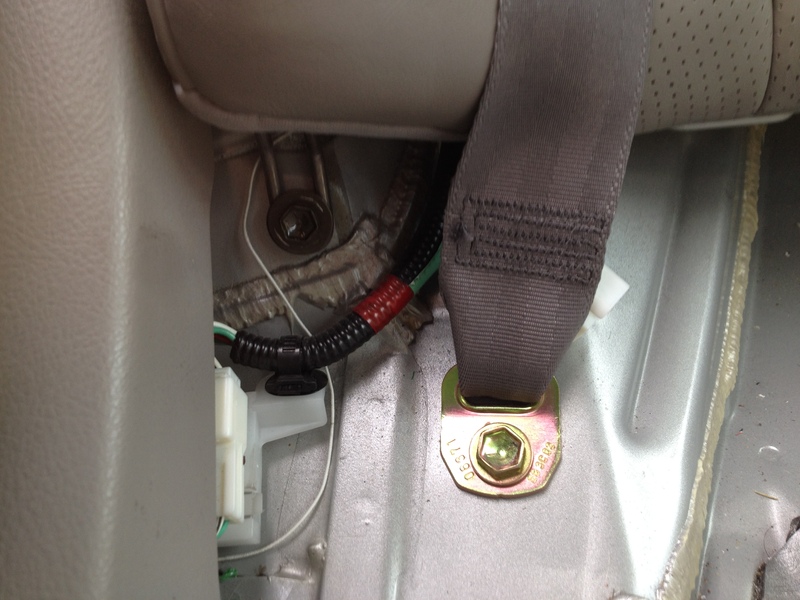 Once they’re unscrewed, move the seatbelts out of the way and remove the seat. Remove pins holding liner. The front part of the rear liner is held down by two black plastic pins. Pop them out with a flathead. Pull the liner up to pop up the sub grate. This is where things get annoying. Removing the entire liner requires taking apart the C-pillars, a level of effort that’s not worth it. You can pull the liner up enough to get the old sub out and get the new one in. Remove subwoofer mount screws. Squeeze your socket wrench in with a 10 mm socket and remove the four screws, pop the connector with a small flathead, and then pull out the sub. Unsolder the wires and remove the plastic mount. You need a torx bit for these screws. If you’re using the Polk dB840, you’ll need to pull the rubber grommet off the top. When putting it into the mount, put the top side on upside down and insert the screws through the bottom instead. When soldering the connectors, make sure to run a wire between the two positive terminals and one between the two negatives. Otherwise, you’ll only be connecting one of the voice coils. As they say in Haynes manuals, assembly is the opposite of removal. Just don’t forget to plug everything back in. Also, getting the seat cushion back into its spot will require some serious force. I used my knees to push it in far enough for it to pop into its slot. I was going to just deal with it when I went in for an oil change, but since I was pulling the car apart anyway, I figured I’d look into a fix for this. Turns out, it’s really easy. 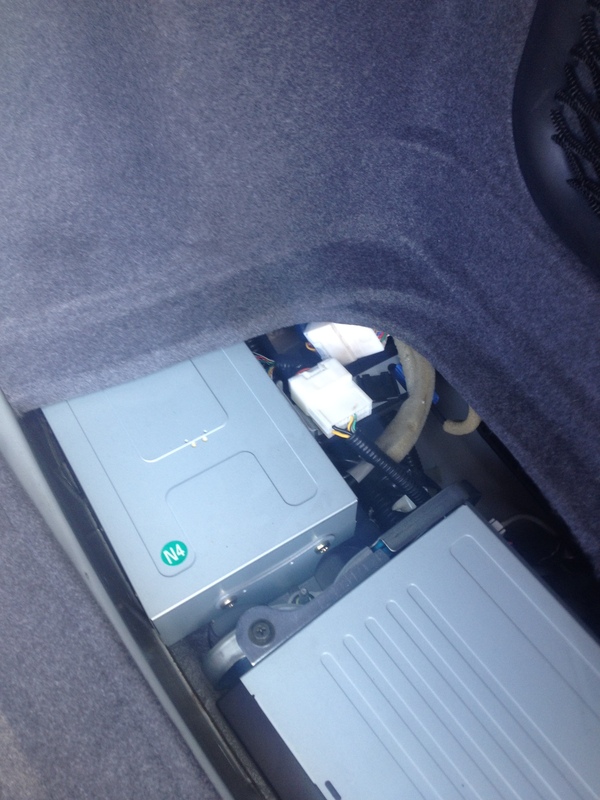 Open the trunk, lift up the right side of the carpet, and open the cover over the compartment on the right side. Next to the navigation drive are two large white plugs. Disconnect both and then plug them back in, but into the other plug – the male on the left side goes into the female on the right and vice versa. The cables are short, but it’s doable. I ran the right side female under the metal mount and pulled the right side male off its mount to make it work. Presto, annoying message is gone, for the total cost of $0. Update: The rear left speaker stopped working despite the internet saying it wouldn’t. I ended up plugging it back in the way it was. I’ll just deal with the stupid messages until I research this further. 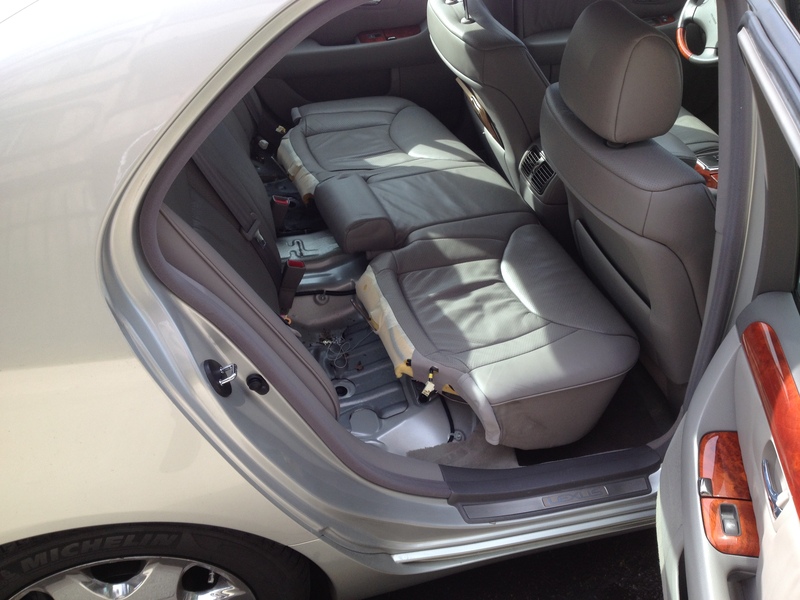 This entry was posted in Cars and tagged How To, Lexus LS 430. Bookmark the permalink. Thank you for the info on accessing the subwoofer, worked fine. I was able to release the tabs on the deck by pushing down on back left and right corners and pushing the sides out a little and remove the deck without doing anything to the C-pillars. This made access to the speaker very easy. My subwoofer on my 2002 Lexus LS430 just unplugged and was held in place by 4 10mm bolts. Since it is a 16 ohm sub and it served my purposes fine running on the OEM head unit, I had it rebuilt at a local speaker shop for $60 on a 1 day turnaround. Thanks again. You’re very welcome, glad to have helped! How did you connect the bracket to the Polk sub? did you drill holes into it? Are you talking about the bracket as seen in the pic under #11? No, you just have to put it on inverted. By mount I meant bracket, Apologies for the confusion. I am reading on other web sites (esp amazon) that the subwoofer is wired in series to get 8 ohms. Are you having any problem with wiring them in parallel (2 ohms)? Is the stock 12 ohms or 2 ohms? Thanks! The factory sub is 2ohms, which is why it’s hard to find aftermarket options. You want to match the impedance, otherwise the amp will cut out since a higher impedance requires more current. You need to replace the amp first if you want to use a sub with a different impedance. THANKS! I finally finished the installation. Your instructions were great! 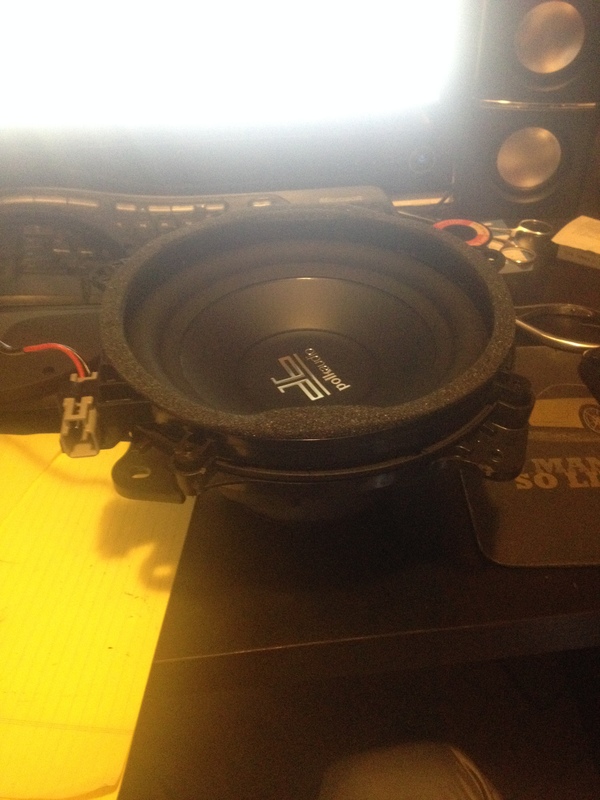 Hey im doing my 2001 ls430 woofer in about a week. Do you have a email i can contact u on for help if needed. Yup. I am early for not to write it out exactly as I already get enough spam. Thanks for your guide here, a huge help with this. I’ve used the Polk db840DVC and everything went smoothly, your info on putting the bracket on inverted saved me lot’s of time. I did wire the speaker +to+ and -to- to get 2 ohms, the original was the Mark Levinson. I do notice that the sound cuts out entirely if I turn the volume up loud, is this because the Polk is a bigger speaker somehow? I have disconnected the Lexus Link System by the directions above, if that matters. It has something to do with the gain on the amp, I encountered this as well. I just turned the head unit up and used minimal needed level on the master volume. I sold the car for unrelated reasons (started a job with a longer commute, steering column was going out) about a month after writing this, so I never fiddled with it further.